Brown, K. (2017). Accessibility for Students with ASD: Legal Perspectives in the United States. In H. C. Alphin Jr. (Ed.). Exploring the Future of Accessibility in Higher Education (pp. 81-103). Hershey, PA: IGI Global. 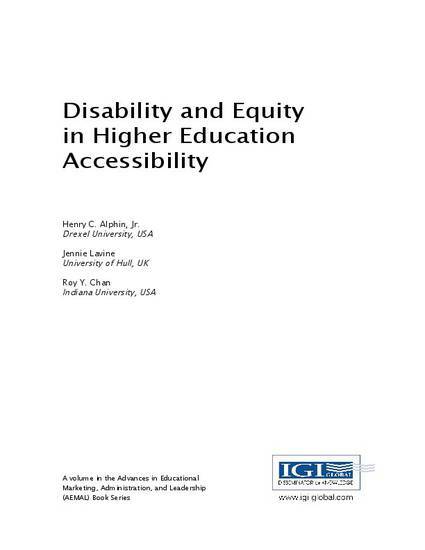 This chapter contributes to important conversations about accessibility in higher education by examining legal issues that shape experiences of students with autism spectrum disorder (ASD). The chapter begins by outlining the relationship between reasonable accommodations and academic success. Then, it provides an overview of ASD in relation to postsecondary education. A substantive portion of the chapter delineates current legal topics, including federal law, case law, and Office of Civil Rights (OCR) letters. Functional limitations associated with ASD are social or sensory in nature. However, legal precedent in the United States defines the major life activity of learning in a manner that does not usually include these components, thereby limiting access to sensory and social accommodations. The chapter concludes by discussing Title IX and students with ASD that experience sexual assault, the value of neurodiversity, and future implications for accessibility as the number of students with ASD in postsecondary education increases.